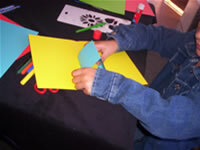 Start by folding an A4 sheet of thin card in half and then cut out a 10cm x 10cm square of thin card. Use different colors of thin card, if you wish. 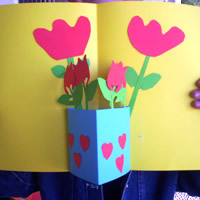 Fold a small lip on the edges of your smaller card and glue it inside your folded sheet to make your vase. 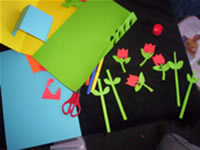 You can cut out some flowers, using green thin card to make your stalks and leaves and any other colors to make your flowers - roses, tulips, daisies, etc... You can use stencils to trace some flowers. Glue your flowers inside your vase. Make sure you do this nice and neatly to make sure it is hidden when you close your card. Now to decorate your vase - cut out small shapes (hearts, diamonds,etc.) 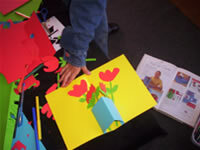 or some more flowers if you like, and to use for decorating the rest of your card. Now you have a beautiful pop-up card. 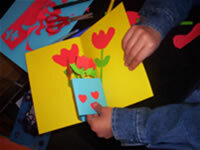 Write a message to a friend or someone you love. 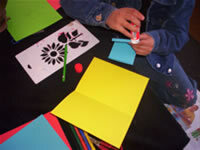 Tip: When trying something for the first time, practise on a scrap of paper first.